"Fuzzy control" and "Fuzzy Control" redirect here. For the rock band, see Fuzzy Control (band). Fuzzy logic is widely used in machine control. The term "fuzzy" refers to the fact that the logic involved can deal with concepts that cannot be expressed as the "true" or "false" but rather as "partially true". Although alternative approaches such as genetic algorithms and neural networks can perform just as well as fuzzy logic in many cases, fuzzy logic has the advantage that the solution to the problem can be cast in terms that human operators can understand, so that their experience can be used in the design of the controller. This makes it easier to mechanize tasks that are already successfully performed by humans. Fuzzy logic was first proposed by Lotfi A. Zadeh of the University of California at Berkeley in a 1965 paper. He elaborated on his ideas in a 1973 paper that introduced the concept of "linguistic variables", which in this article equates to a variable defined as a fuzzy set. Other research followed, with the first industrial application, a cement kiln built in Denmark, coming on line in 1975. Fuzzy systems were initially implemented in Japan. Interest in fuzzy systems was sparked by Seiji Yasunobu and Soji Miyamoto of Hitachi, who in 1985 provided simulations that demonstrated the feasibility of fuzzy control systems for the Sendai Subway. Their ideas were adopted, and fuzzy systems were used to control accelerating, braking, and stopping when the Namboku Line opened in 1987. In 1987, Takeshi Yamakawa demonstrated the use of fuzzy control, through a set of simple dedicated fuzzy logic chips, in an "inverted pendulum" experiment. This is a classic control problem, in which a vehicle tries to keep a pole mounted on its top by a hinge upright by moving back and forth. Yamakawa subsequently made the demonstration more sophisticated by mounting a wine glass containing water and even a live mouse to the top of the pendulum: the system maintained stability in both cases. Yamakawa eventually went on to organize his own fuzzy-systems research lab to help exploit his patents in the field. Japanese engineers subsequently developed a wide range of fuzzy systems for both industrial and consumer applications. In 1988 Japan established the Laboratory for International Fuzzy Engineering (LIFE), a cooperative arrangement between 48 companies to pursue fuzzy research. The automotive company Volkswagen was the only foreign corporate member of LIFE, dispatching a researcher for a duration of three years. Japanese consumer goods often incorporate fuzzy systems. Matsushita vacuum cleaners use microcontrollers running fuzzy algorithms to interrogate dust sensors and adjust suction power accordingly. Hitachi washing machines use fuzzy controllers to load-weight, fabric-mix, and dirt sensors and automatically set the wash cycle for the best use of power, water, and detergent. Canon developed an autofocusing camera that uses a charge-coupled device (CCD) to measure the clarity of the image in six regions of its field of view and use the information provided to determine if the image is in focus. It also tracks the rate of change of lens movement during focusing, and controls its speed to prevent overshoot. The camera's fuzzy control system uses 12 inputs: 6 to obtain the current clarity data provided by the CCD and 6 to measure the rate of change of lens movement. The output is the position of the lens. The fuzzy control system uses 13 rules and requires 1.1 kilobytes of memory. An industrial air conditioner designed by Mitsubishi uses 25 heating rules and 25 cooling rules. A temperature sensor provides input, with control outputs fed to an inverter, a compressor valve, and a fan motor. Compared to the previous design, the fuzzy controller heats and cools five times faster, reduces power consumption by 24%, increases temperature stability by a factor of two, and uses fewer sensors. Other applications investigated or implemented include: character and handwriting recognition; optical fuzzy systems; robots, including one for making Japanese flower arrangements; voice-controlled robot helicopters (hovering is a "balancing act" rather similar to the inverted pendulum problem); rehabilitation robotics to provide patient-specific solutions (e.g. to control heart rate and blood pressure ); control of flow of powders in film manufacture; elevator systems; and so on. Work on fuzzy systems is also proceeding in the United State and Europe, although on a less extensive scale than in Japan. The US Environmental Protection Agency has investigated fuzzy control for energy-efficient motors, and NASA has studied fuzzy control for automated space docking: simulations show that a fuzzy control system can greatly reduce fuel consumption. Firms such as Boeing, General Motors, Allen-Bradley, Chrysler, Eaton, and Whirlpool have worked on fuzzy logic for use in low-power refrigerators, improved automotive transmissions, and energy-efficient electric motors. In 1995 Maytag introduced an "intelligent" dishwasher based on a fuzzy controller and a "one-stop sensing module" that combines a thermistor, for temperature measurement; a conductivity sensor, to measure detergent level from the ions present in the wash; a turbidity sensor that measures scattered and transmitted light to measure the soiling of the wash; and a magnetostrictive sensor to read spin rate. The system determines the optimum wash cycle for any load to obtain the best results with the least amount of energy, detergent, and water. It even adjusts for dried-on foods by tracking the last time the door was opened, and estimates the number of dishes by the number of times the door was opened. Research and development is also continuing on fuzzy applications in software, as opposed to firmware, design, including fuzzy expert systems and integration of fuzzy logic with neural-network and so-called adaptive "genetic" software systems, with the ultimate goal of building "self-learning" fuzzy-control systems. These systems can be employed to control complex, nonlinear dynamic plants, for example, human body. The input variables in a fuzzy control system are in general mapped by sets of membership functions similar to this, known as "fuzzy sets". 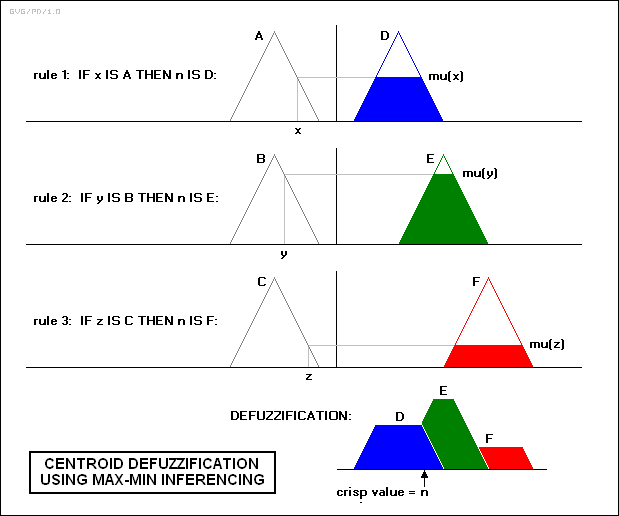 The process of converting a crisp input value to a fuzzy value is called "fuzzification". A control system may also have various types of switch, or "ON-OFF", inputs along with its analog inputs, and such switch inputs of course will always have a truth value equal to either 1 or 0, but the scheme can deal with them as simplified fuzzy functions that happen to be either one value or another. In this example, the two input variables are "brake temperature" and "speed" that have values defined as fuzzy sets. The output variable, "brake pressure" is also defined by a fuzzy set that can have values like "static" or "slightly increased" or "slightly decreased" etc. Traditional control systems are based on mathematical models in which the control system is described using one or more differential equations that define the system response to its inputs. Such systems are often implemented as "PID controllers" (proportional-integral-derivative controllers). They are the products of decades of development and theoretical analysis, and are highly effective. Fuzzy controllers are very simple conceptually. They consist of an input stage, a processing stage, and an output stage. The input stage maps sensor or other inputs, such as switches, thumbwheels, and so on, to the appropriate membership functions and truth values. The processing stage invokes each appropriate rule and generates a result for each, then combines the results of the rules. Finally, the output stage converts the combined result back into a specific control output value. The most common shape of membership functions is triangular, although trapezoidal and bell curves are also used, but the shape is generally less important than the number of curves and their placement. From three to seven curves are generally appropriate to cover the required range of an input value, or the "universe of discourse" in fuzzy jargon. This rule uses the truth value of the "temperature" input, which is some truth value of "cold", to generate a result in the fuzzy set for the "heater" output, which is some value of "high". This result is used with the results of other rules to finally generate the crisp composite output. Obviously, the greater the truth value of "cold", the higher the truth value of "high", though this does not necessarily mean that the output itself will be set to "high" since this is only one rule among many. In some cases, the membership functions can be modified by "hedges" that are equivalent to adverbs. Common hedges include "about", "near", "close to", "approximately", "very", "slightly", "too", "extremely", and "somewhat". These operations may have precise definitions, though the definitions can vary considerably between different implementations. "Very", for one example, squares membership functions; since the membership values are always less than 1, this narrows the membership function. "Extremely" cubes the values to give greater narrowing, while "somewhat" broadens the function by taking the square root. There are several ways to define the result of a rule, but one of the most common and simplest is the "max-min" inference method, in which the output membership function is given the truth value generated by the premise. Rules can be solved in parallel in hardware, or sequentially in software. The results of all the rules that have fired are "defuzzified" to a crisp value by one of several methods. There are dozens, in theory, each with various advantages or drawbacks. 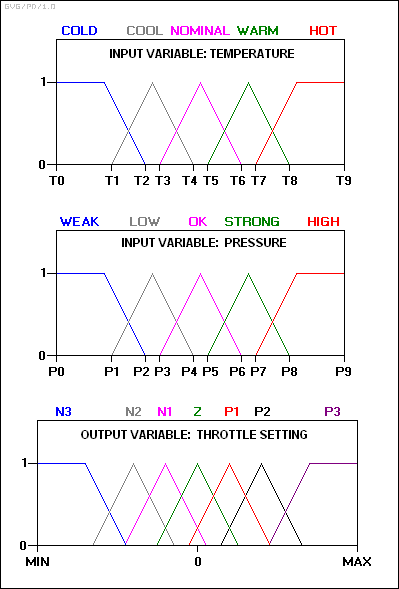 The output value will adjust the throttle and then the control cycle will begin again to generate the next value . mu(1): Truth value of the result membership function for rule 1. In terms of a centroid calculation, this is the "mass" of this result for this discrete case. output(1): Value (for rule 1) where the result membership function (ZE) is maximum over the output variable fuzzy set range. That is, in terms of a centroid calculation, the location of the "center of mass" for this individual result. This value is independent of the value of "mu". It simply identifies the location of ZE along the output range. In our example, the values of mu correspond to the masses, and the values of X to location of the masses (mu, however, only 'corresponds to the masses' if the initial 'mass' of the output functions are all the same/equivalent. If they are not the same, i.e. some are narrow triangles, while others maybe wide trapizoids or shouldered triangles, then the mass or area of the output function must be known or calculated. It is this mass that is then scaled by mu and multiplied by its location X_i). As a first example, consider an anti-lock braking system, directed by a microcontroller chip. The microcontroller has to make decisions based on brake temperature, speed, and other variables in the system. 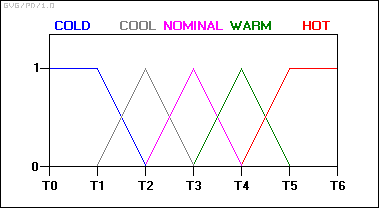 The variable "temperature" in this system can be subdivided into a range of "states": "cold", "cool", "moderate", "warm", "hot", "very hot". The transition from one state to the next is hard to define. An arbitrary static threshold might be set to divide "warm" from "hot". For example, at exactly 90 degrees, warm ends and hot begins. But this would result in a discontinuous change when the input value passed over that threshold. The transition wouldn't be smooth, as would be required in braking situations. The way around this is to make the states fuzzy. That is, allow them to change gradually from one state to the next. In order to do this there must be a dynamic relationship established between different factors. With this scheme, the input variable's state no longer jumps abruptly from one state to the next. Instead, as the temperature changes, it loses value in one membership function while gaining value in the next. In other words, its ranking in the category of cold decreases as it becomes more highly ranked in the warmer category. At any sampled timeframe, the "truth value" of the brake temperature will almost always be in some degree part of two membership functions: i.e. : '0.6 nominal and 0.4 warm', or '0.7 nominal and 0.3 cool', and so on. The above example demonstrates a simple application, using the abstraction of values from multiple values. This only represents one kind of data, however, in this case, temperature. Adding additional sophistication to this braking system, could be done by additional factors such as traction, speed, inertia, set up in dynamic functions, according to the designed fuzzy system. In spite of the appearance there are several difficulties to give a rigorous logical interpretation of the IF-THEN rules. As an example, interpret a rule as IF (temperature is "cold") THEN (heater is "high") by the first order formula Cold(x)→High(y) and assume that r is an input such that Cold(r) is false. Then the formula Cold(r)→High(t) is true for any t and therefore any t gives a correct control given r. A rigorous logical justification of fuzzy control is given in Hájek's book (see Chapter 7) where fuzzy control is represented as a theory of Hájek's basic logic. Also in Gerla 2005  another logical approach to fuzzy control is proposed based on fuzzy logic programming.Indeed, denote by f the fuzzy function arising of an IF-THEN systems of rules. Then we can translate this system into a fuzzy program P containing a series of rules whose head is "Good(x,y)". The interpretation of this predicate in the least fuzzy Herbrand model of P coincides with f. This gives further useful tools to fuzzy control. ^ a b Pedrycz, Witold (1993). Fuzzy control and fuzzy systems (2 ed.). Research Studies Press Ltd.
^ a b Hájek, Petr (1998). Metamathematics of fuzzy logic (4 ed.). Springer Science & Business Media. ^ Zadeh, Lotfi A. (1965). "Fuzzy sets". Information and Control. 8 (3): 338–353. doi:10.1016/S0019-9958(65)90241-X. ^ Zadeh, Lotfi A. (1973). "Outline of a new approach to the analysis of complex systems and decision processes". IEEE Transactions on Systems, Man and Cybernetics. 1: 28–44. doi:10.1109/TSMC.1973.5408575. ^ a b Sarabadani Tafreshi, Amirehsan; Klamroth-Marganska, V.; Nussbaumer, S.; Riener, R. (2015). "Real-time closed-loop control of human heart rate and blood pressure". IEEE Transactions on Biomedical Engineering. 62 (5): 1434–1442. doi:10.1109/TBME.2015.2391234. PMID 25594957. ^ a b Mamdani, Ebrahim H (1974). "Application of fuzzy algorithms for control of simple dynamic plant". Proceedings of the Institution of Electrical Engineers. 121 (12): 1585–1588. doi:10.1049/piee.1974.0328. ^ Lugli, A. B.; Neto, E. R.; Henriques, J. P. C.; Hervas, M. D. A.; Santos, M. M. D.; Justo, J. F. (2016). "Industrial Application Control With Fuzzy Systems" (PDF). Int. J. Innovative Computing Information and Control. 12 (2): 665–676. ^ Bastian, Andreas (2000). "Identifying fuzzy models utilizing genetic programming" (PDF). Fuzzy Sets and Systems. 113 (3): 333–350. doi:10.1016/S0165-0114(98)00086-4. ^ Vichuzhanin, Vladimir (12 April 2012). "Realization of a fuzzy controller with fuzzy dynamic correction". Central European Journal of Engineering. 2 (3): 392–398. doi:10.2478/s13531-012-0003-7. ^ Gerla, Giangiacomo (2005). "Fuzzy logic programming and fuzzy control". Studia Logica. 79 (2): 231–254. CiteSeerX 10.1.1.103.1143. doi:10.1007/s11225-005-2977-0. Kazuo Tanaka; Hua O. Wang (2001). Fuzzy control systems design and analysis: a linear matrix inequality approach. John Wiley and Sons. ISBN 978-0-471-32324-2. Cox, E. (Oct. 1992). Fuzzy fundamentals. IEEE Spectrum, 29:10. pp. 58–61. Cox, E. (Feb. 1993) Adaptive fuzzy systems. IEEE Spectrum, 30:2. pp. 7–31.